Athens Olympic champion Saori Yoshida won a record fifth straight world title in September 2007 spearheading Japan's dominance in women's wrestling on the road to Beijing. But the pint-sized 25-year-old security guard (born October 5, 1982), who beat Canada's Tonya Verbeek in the 48-55kg final to claim gold at Athens, admits she has been under such intense scrutiny for so long her rivals are closing the gap. Yoshida is the superstar of women's wrestling and, since claiming her first world title by beating American Tina George for gold in 2002, had been considered unbeatable. 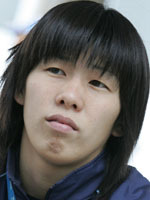 Yoshida saw her winning streak snapped at 119 matches in January 2008 with a defeat to American Marcie Van Dusen at a World Cup team competition. Van Dusen, who didn't make the cut for the Olympics, had practiced a certain reverse and throw in case she ever came up against hitherto unrivalled Yoshida who was left in a state of shock. She sat near the edge of the mat crying throughout the day explaining: ''I thought I would win, so I think I went a little too easy and that hurt me.' "I still have Beijing. I have to continue to train and I'll definitely take the gold at the Olympics." In the 51-55kg (121.3-lbs) class in Baku 2007, where Japanese women won four out of seven world golds, she defeated Swede Ida Karlsson 2-0 in the final, stretching her winning streak to 115 since losing to two-time world champion Seiko Yamamoto at the 2001 national championships. Yoshida punched the air with both hands and jokingly threw down her coach Kazuhito Sakae several times on the mat to amuse the crowd. Like many other amateur wrestlers in Japan, where there is a huge cult following for the hyped-up spectacle of pro-wrestling, she was born into a wrestling family. She started wrestling at the age of three under the watchful eye of her father, former national champion Hidekatsu Yoshida. Japan has dominated women's wrestling, winning 54 titles from the past 19 world championships since the 1987 event in Oslo. Yoshida and Kaori Icho in 63kg won two out of four gold medals on offer in Athens in 2004 when the sport made its Olympic debut. Icho, 23, also triumphed in Baku for a fifth straight world title and her elder sister Chiharu, 25, also won the 48kg title. Yoshida, who earlier said she wanted to fight on until the 2012 London Olympics, braced herself anew for her Olympic challenge. "If I remain complacent, I cannot win for the second straight time in Beijing. It's really, really getting more difficult."